Have you strike lottery or jackpot before? The thing is, there isn’t much of a problem for some of my peers who met their loved ones as they carried on living their lives, fulfilling their dreams and overcoming obstacles with the support of their ‘boy’. But I guess it isn’t the case for everyone and because in life, there’s always this recurring term of ‘exceptions’. And I am one of the exceptions when it comes to love. I’m a hopeless romantic, believing in fate and hoping that a love story would unexpectedly unfold by itself. Thus going for online dating, match making sessions and dating events isn’t quite what I was hoping for. And a few years back, I was just telling my friends that I wouldn’t resort to this even if I have to be single for the rest of my life. But somehow, as seasons change and life evolves, my perspectives have shifted too. And I have heard of too many dating cliches and taboos that I started to ask myself, ‘why bother?’ As a matter-of-fact, meeting singles with the intention of being in a relationship may seem somewhat ‘unnatural’ at first but come to think of it, if you happen to meet ‘the right one’ among the pool of bachelors, doesn’t that depends on luck and perhaps fate too? Truly, it might come off as somewhat romantic too, right? So this brings me to talk about my experience with eSynchrony, a renown dating agency in Singapore which managed by the same team who first created Lunch Actually. It might ring a bell if I mention You could call them the ‘dating experts’ as they’ve got almost 9 years of experience in pairing love birds together. So when I received a blogging assignment for me to review about their services, it did sent my heart fluttering. Gosh, what if I DO really meet my other half ? However, I only had one date, one month’s worth of time and one chance to pick the right one. Boy, this is more stressful than anything else! If you had read about my first post on eSynchrony, I actually mentioned about the personality test and the profiles of my matches. To be honest, I didn’t fancy any of the guys who clicked ‘approve for date’ on my profile page because either their profile looks too bare or don’t meet the criteria which I’ve set for myself. Call me Miss Choosy or whatever. When I didn’t set a criteria on the guys I would like to date, I actually ended up falling for the wrong guy. That painful lesson has now thought me to be smarter and set some expectations for myself, but of course, not too unrealistic. Here’s my list. 1. be leading an active lifestyle. 3. be able to hold an intelligent conversation. Come to think of it, maybe I shouldn’t have just limit it to 3 traits and eliminate one of the criterion. Then, I probably would have chosen other guys instead of … him. Right. So where should I begin about THE DATE? I’m so familiar with this page right now after frequenting the website quite a number of times over a month or so. At one shot, I could glance through the update page and know what’s new. Thus, I would spend a nights browsing through profiles just to find a profile that catches my eye. Some profiles were interesting and it did caught my attention but most of them didn’t respond as to whether they would like to go on a date or not. Others were just inactive on eSynchrony and some doesn’t even include a photograph of themselves. I tend to eliminate them based on their photos because I would feel insecure dating a person whom I don’t even know how he looks like. On the contrary, it might be sound like a fun thing to meet the ‘unknown’ if you’re a risk taker. Interestingly, eSynchrony do generate some statistics and numbers to help you find out more information about your selection process. I always find such information useful as it would provide me with some feedback as to how I could either tweak my profile or my selection criteria in order to be successful in scoring the date of my choice. Finally, LIKE FINALLY, I found someone who appealed to me the most. He’s got a fit physique, an interesting career and a friendly-nature. He works in the aviation industry and is working as a pilot so I could totally envision that we would be exchanging our travel stories on top of our passions and dreams. What made him even more attractive was the photograph of him carrying a child. I work with kids and love kids in general so that is perhaps why that photograph was the ‘X-factor’ for me. It’s strange because I actually never knew that about myself. It’s almost like a journey of self-discovery while playing this dating game. The arrangement of the date was fuss-free as the dating consultant would arrange the date,timing and venue for the both of us. Once everything is confirmed, they would call and reserve a table at the restaurant. And all you need is to wait for the date to happen. He looks charming, tanned and well-built. He was in his mid-thirties and the huge gap wasn’t a concern for me as I always thought that I am mature enough to engage in a conversation with older guys. We had similar interests in the type of music we listen to and we both enjoy hitting the gym. On our first dates, we are usually told what to do and what not to do by those dating gurus. For instance, you should be punctual on your first date and you should dress well to impress as such. But I guess, overall, one shouldn’t be too particular about playing by these rules because a good date is not determined by how well these dating expectations are met. And there’s no strict formula as such when it comes to human connection and love. I knew what his name was because his username on the website was his real name. For a moment, I actually forgot the fact that he probably wouldn’t know what my name is since I didn’t reveal my real name in my profile in fear that I will be ‘googled’. He was different to what I’ve imagined him to be. He did what ‘a guy would actually do during a date’ like paying for the meal and taking the initiative to ask for my number. It might be unfair of me to judge his personality as of right now but I knew that he wasn’t quite the guy for me. I enjoy having deep and intellectual conversations with people because there’s really how I get to know and understand their beliefs and values. My kind of get-to-know-you type of engaging conversations didn’t quite happen during the date so it was a little difficult for the both of us to connect at a deeper level. We exchanged numbers but we sort of both knew that it’s a full-stop to our first encounter. A day after the date, I filled up an online feedback form on eSynchrony. This feedback survey would be useful for both you and eSynchrony in finding a better match for you. So it’s definitely worth the time to update them about how the date went. It does made me realize how unique I am as an individual because I don’t think any random guy would date a girl who eats and cook vegetarian/vegan meals, gyms several times a week, make YouTube singing videos, blogs openly about her likes and passion and being so in love with playing instruments and dancing. Yeah, that is how dateable I am. And that’s basically how my date went. I’ve once loved and have been loved. I believe in love and because I chose love. I would rather love myself singly than to date someone who doesn’t believe in love. Therefore, my story doesn’t ends here as there are more pages to be written. And to those who haven’t found that someone whom you could grow old with, don’t be disheartened and never lose faith in finding the man or woman you love. Seek and you will find. If you need help, there’s always eSynchrony. You are never alone because just like you and I, there are a pool of amazing singles out there seeking for love and companionship. 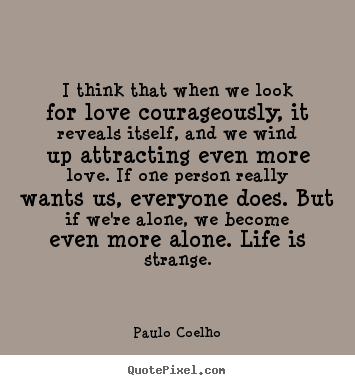 My perspective in love is very much shaped by Paulo Coelho’s books and here I would like to end off with his insightful quotes about love. Love is what make us love ourselves. Love is too beautiful to be missed.